Back in September 1991, The Simpsons kicked off its third season with a memorable episode entitled “Stark Raving Dad,” in which hapless patriarch Homer is shipped off to an insane asylum, where he meets Leon Kompowsky, a beefy fellow inmate who believes himself to be pop superstar Michael Jackson. Under the pseudonym John Jay Smith, Jackson himself voiced the role of the mental patient, making the episode a huge publicity coup for the still-young animated series on Fox. Spurred by this success, the writers wanted very much to do a follow-up episode about Leon Kompowsky, but this time, they had a different musician in mind for the role: Prince. Simpsons staffer Conan O’Brien wrote a script for the proposed show, but The Purple One rejected it. In the wake of Prince’s death last week, some excerpts from that script have started to resurface online. Current (and former) Simpsons showrunner Al Jean has tweeted a couple of tantalizing excerpts from the unproduced O’Brien script. In one, Lisa attempts without success to purchase tickets to a Prince concert. Somehow, spiders are involved. In another excerpt, Prince himself speaks, chatting amiably with Homer’s despised sister-in-law, Selma Bouvier. Disparaging references are made to several Prince films here, including Under The Cherry Moon, Sign O’ The Times, and Graffiti Bridge. 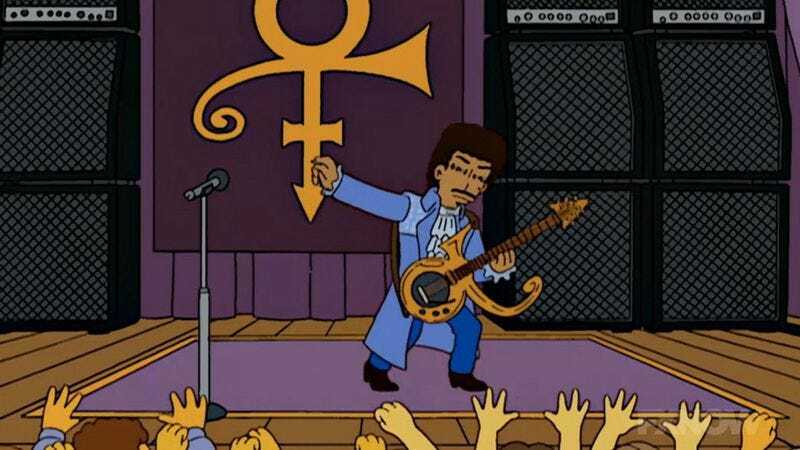 Though this kind of self-kidding is par for the course on The Simpsons, Jean speculates that perhaps Prince wasn’t comfortable with this aspect of the episode. Jean gives credit for finding the script to Jacqueline Atkins, who was an assistant on the show during the early seasons and served as the namesake for State Comptroller Atkins.